I took my kiddos to visit my Grandma (96 years young) over spring break this week, and as that meant air travel and being a long way from home, I got knitting done, but no sewing. I did, however, start to pull fabrics for my next project. 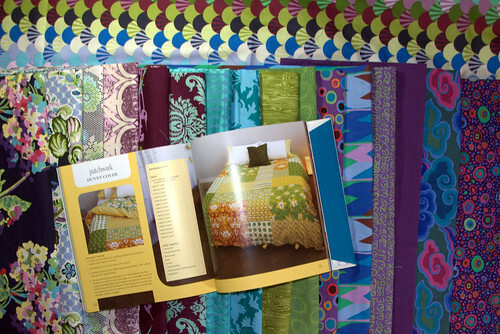 A few weeks back, one of the many online fabric stores I shop from sent an email that featured a project from Joel Dewberry‘s Sewn Spaces– a patchwork duvet cover. It’s such a lovely, simple project, and I couldn’t get it out of my mind. I had the perfect fabric for it…one I’ve been hoarding for ages with no actual plan. 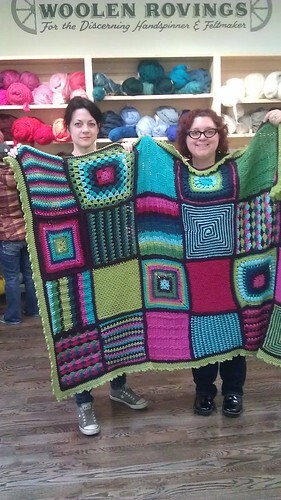 Cameo from Tula Pink‘s Parisville. 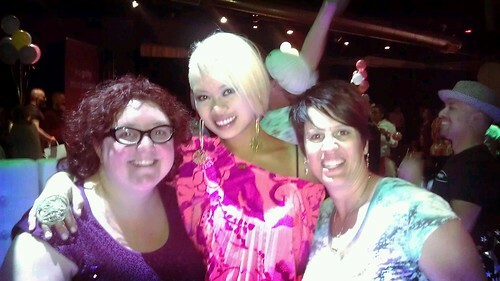 The ladies have the best hair ever! 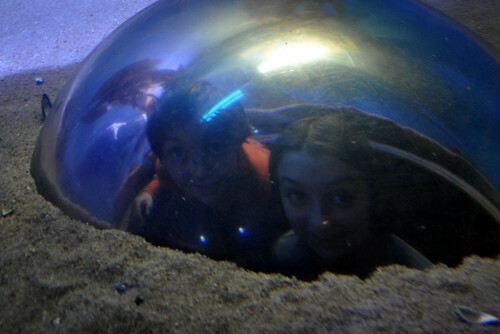 But they are large- 5″ or so. Hard to show off in lots of projects. I was thinking maybe curtains, until I saw that duvet cover. I pulled fabrics, but didn’t have time to start cutting. Which might not be a bad thing, because there are 2 too many fabrics in that pile. I think I’ve decided on one to pull, but not the other. What do you think? What 2 fabrics would you remove? 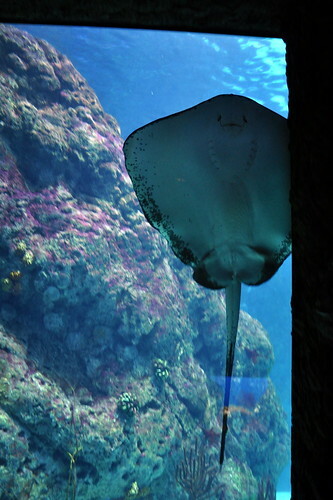 And I’d like to say thanks to all the new folks who came by and left comments last week- it was great to “meet” you all! Longtime readers of this and my old blog will know I love Mondo. 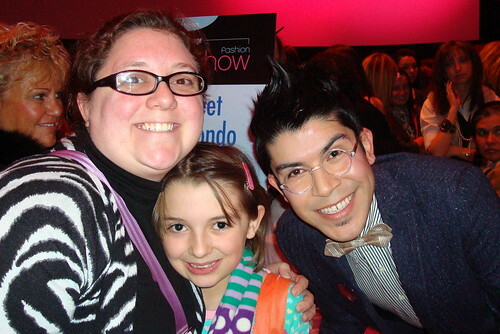 I’ve been a Project Runway fan for years- it was my “gateway” reality TV show. And when Denver was finally represented by a designer, at first I was bummed- Mondo seemed so quiet in the first few episodes.And then he broke out from the pack, both with his amazing pattern mixing, and his moving personal story. 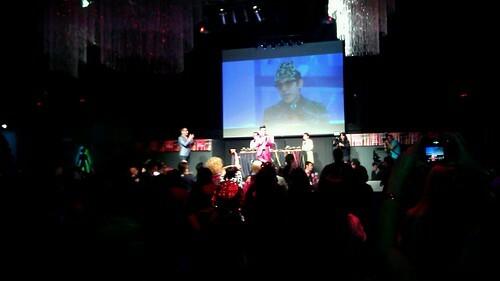 And a fan girl was born… I nearly gave up on the show when they awarded top honors to “Retchin Gretchen”. Many others felt the same way, and the blogosphere has long speculated that the Project Runway Allstars was created to right the wrong inflicted on Mondo in Season 8. In 2011, Annie and I got to (briefly) meet the man himself at an event to benefit the local branch of Goodwill. That was when her love of him began. Now, she’s a fan girl to rival me, but I digress. And last night…I went to Mondo Bazarro, the finale viewing party here in Denver, hosted by Mondo, to benefit another great local non-profit, the Colorado Aids Project. The event was carnival themed, with goofy games to play, fab decor, and a scary inflated clown. Well, other folks didn’t find it scary, but after reading It, I’ve never been able to look at clowns the same way. 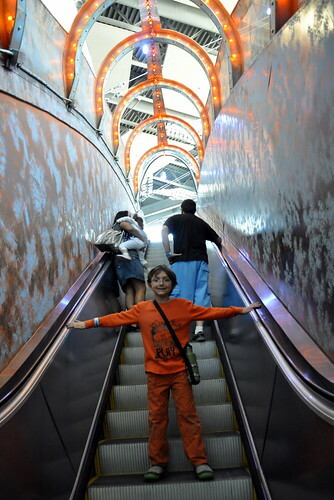 Here are some great photos of the event from The Denver Post– and here is a facebook photo including the scary clown. 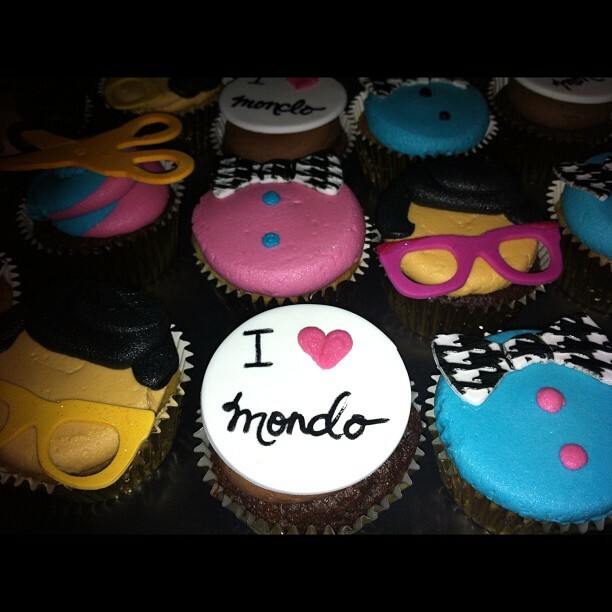 If we’d sprung for the VIP tickets, there would have been mingling and schmoozing and Mondo cupcakes. We bought some shirts. We played some games (the ducky matching worked best for me, but Amber rocked the Plinko.) We munched on the free Popchips– they sponsor Mondo and support CAP, so, hooray! 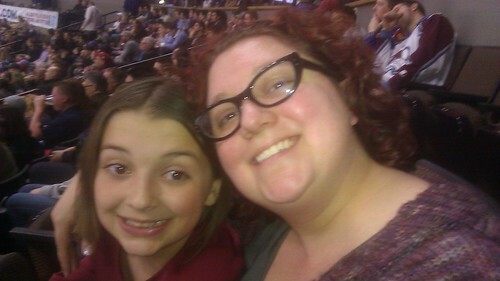 We had some drinks, and scored some good viewing seats… And then we watched. And you know who won, right? After the show was over the party rocked on. 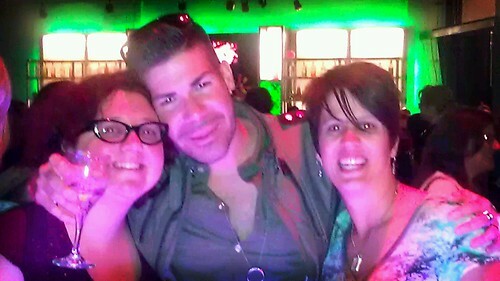 In the VIP viewing section were some other fabulous Project Runway alums, who graciously took photos with the hoi polloi. Recognize Season 9 winner Anya with her new blonde hair and engagement ring? Or what about the adorable Casanova from Season 8? Do you watch Project Runway? 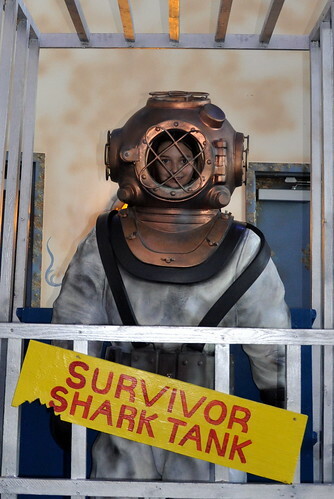 What about any other reality TV? I will proudly admit to loving Ru-Paul’s Drag Race (tho not this season as much), and not as proudly admit that I’m a bit addicted to America’s Next Top Model. But PR is my fave! 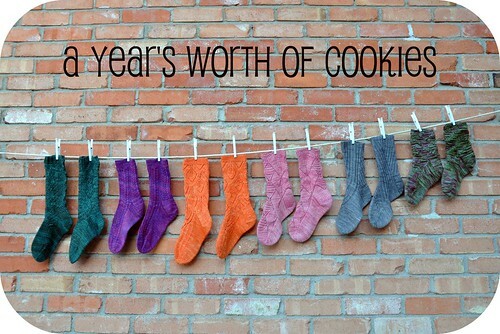 2011 was the inaugural year for the Cookie A Sock Club– and I wiggled my way into a spot from the wait list. 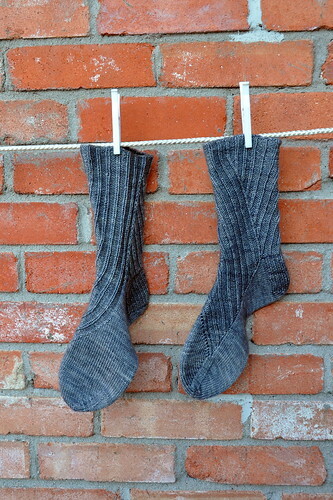 I was a tiny bit worried- the only other sock club I ever joined was the Rockin Sock Club. I didn’t always love the yarn or patterns, which is always the risk of a club. 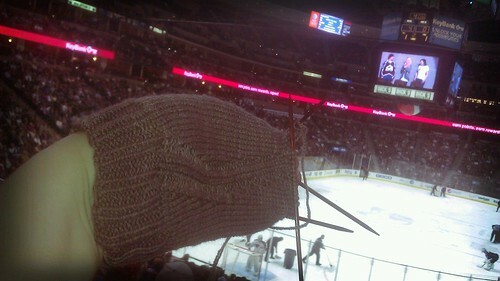 But, I’ve never knit a Cookie pattern I didn’t like, and, the club promised to be mainly solid-ish yarns. 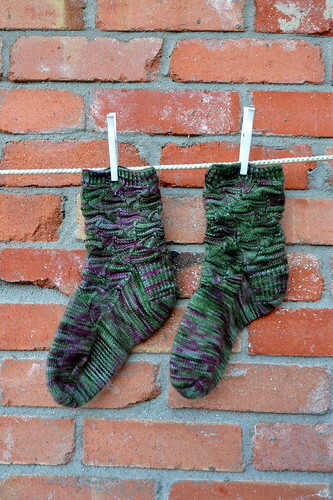 Surprisingly, given my penchant for buying wild and crazy sock yarns, this was very appealing to me. It actually does make sense- as I’ve been knitting more and more complicated socks, I’ve gone more toward simpler colors, as they let my hard work shine through. What was my point? 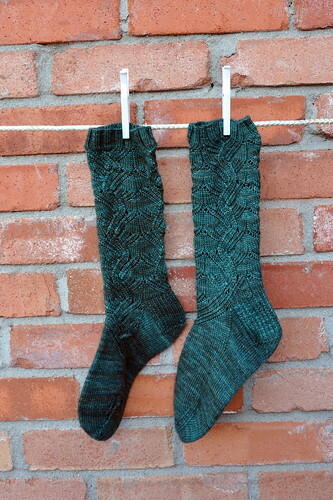 Oh, yeah… While I still have several intact, untouched kits from my Rockin Sock Club year, I finished a pair of socks from each of the 6 Cookie A shipments! 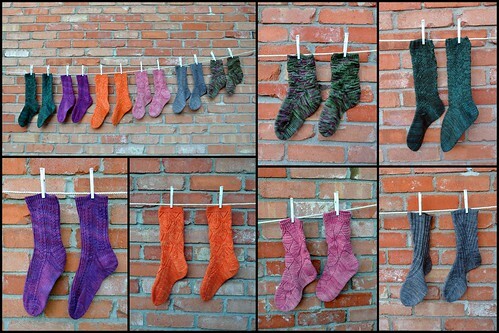 And since each month had 2 patterns, in one month I even made 2 pairs! I loved the club so much that when 2012 signups opened, I forked over my payment immediately. My first shipment was delayed by the USPS, and so I just finally got around to winding the yarn for the first pair of 2012. 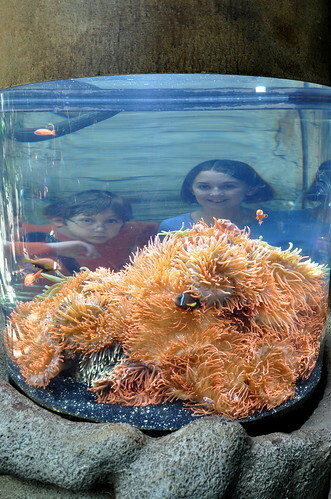 But before I move on, it seemed like a good idea to show off the fruits of 2011! Tonight my awesome husband rigged up a faux-clothesline for me, so I could take some decent photos. 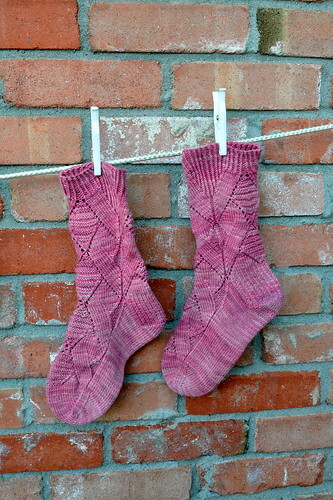 Without further ado, I present to you…my 2011 Cookie A Sock Club finishes! I’ve got to fly next week (taking the kids to see my grandma, who is 96 and in failing health), so I bet I’ll be able to show you the first Cookie A socks of 2012 soon… Stay tuned! 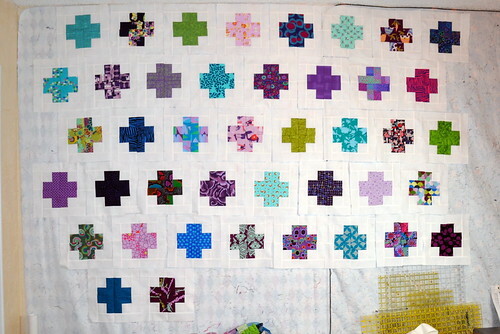 I am continuing to plug away at my Modern Cross quilt (link will take you to archive of previous posts w much much better photos! )- and I’ve hit the point where I need to make a few decisions. So, at the halfway point, it’s time to decide- can I repeat fabrics in any of the squares, or do I need to come up with 100 different fabrics? I do really truly adore some of the fabrics, so using them twice would be fun. 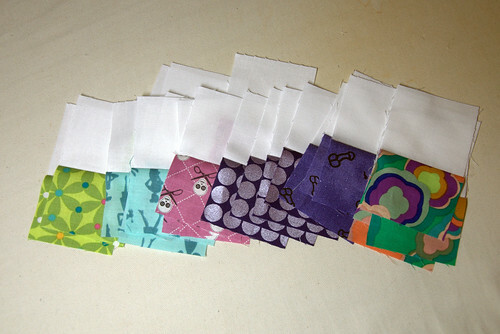 But then again, coming up with 100 different fabrics almost entirely from stash also seems fun. Nightmare inducing, and also like publicly admitting just how much of a stash problem I have, but still fun. 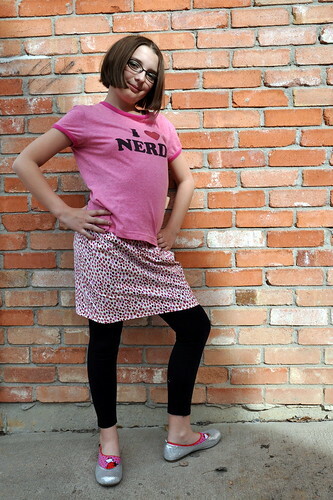 Yesterday was a monumental day- Annie made her first skirt! 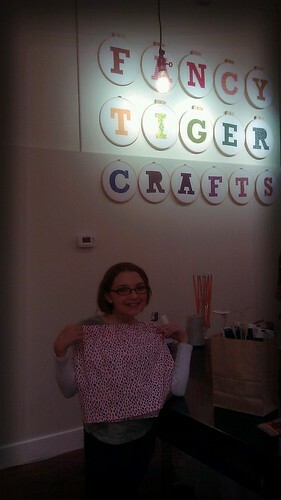 She took a class at my beloved Fancy Tiger, and in the course of 2 short hours, she completed a gorgeous spring skirt! Her fabric choice was a shock to me- this girl LOVES blue. 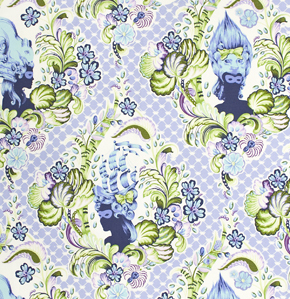 But she picked out a sweet little Alexander Henry print, covered in tiny pink strawberries and grapes. While she was stitching, I hit the Goodwill up the street, and found her a shirt that both matches perfectly, and fits her sensibilities exactly. What do you think? 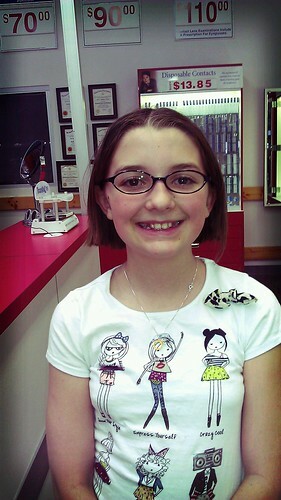 Annie will be 11 next month- much younger than I was when the crafty bug bit me. How old were you when you started sewing, knitting, crocheting or crafting in general? 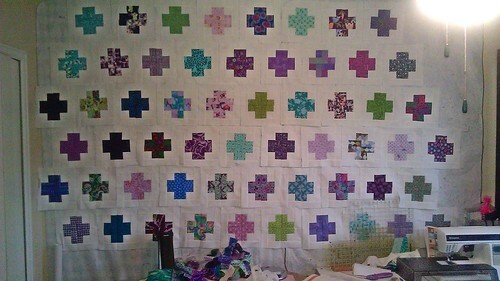 By the time I finish this quilt top, I’ll have to change the name from “Modern Cross” to “Ancient History”. Now that I put the borders on the final Christmas top, I can move forward. 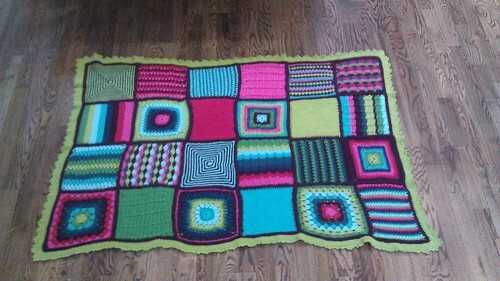 But I still can’t start a completely new project, what with 30 some odd Modern Cross blocks done, but many more to go. I was even able to start the next 6 before having to move on. And I finally found a place to use some of the very, um, unique fabric I picked up several years back. That one little FQ has been waiting quite a while for just the right project. I’m thinking you can guess which one I mean? Yeah, that one… ;-P Do you have any naughty or truly ridiculous fabrics in YOUR stash? What about novelties in general? I am a sucker for a cute or funny or retro novelty print, and I’ve been trying to work a bunch of them into these blocks. There are already skulls with scissors, owls, hedgehogs, mushrooms, arabian knights, and I’m only halfway done! Overall I’m still really loving this quilt, but it needs more purple. My original plan was to make it mainly purple, with some blue and green crosses. It looks more blue than I had intended. 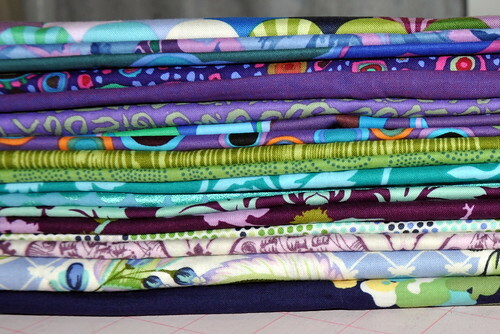 I picked up a few more pieces of purple fabric at the Snappy Quilts 1st birthday sale yesterday. Because I need more fabric like I need more yarn. It’s another one of those posts where I go on and on about how I never seem to sew anymore, but when I finally do, it feels wonderful. Yeah, I know, I’ve said it all before. Remember that last crazy burst of sewing back in November and December? 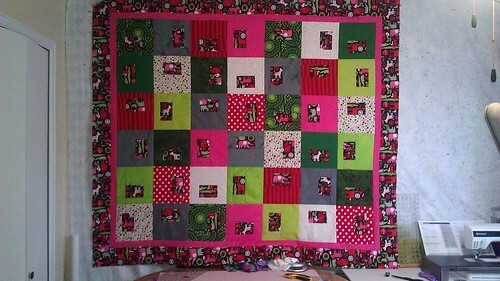 When I attempted to crank out 2 complete quilts before Xmas, and failed? And then didn’t sew anything for (mumble mumble) months? I finally put the borders on the second quilt. And then took a lousy cell phone photo to prove it. I did learn one thing about myself. It turns out that the clutter in my sewing room stops me from sewing. On Monday, I cleaned up a bit (read: moved stuff from one room to another so I could pretend I dealt with the problem.) And then, lo and behold, I found my sewing mojo. I felt totally ready to tackle a new project, or at least pick up my modern cross squares again, but I decided to behave and put the borders on the animal quilt. Now that that’s done, I can move on. How about you? Can you work when your space gets cluttered, or do you need order? 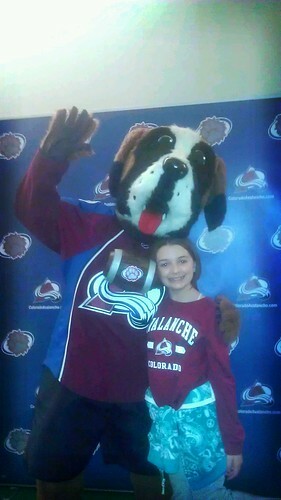 Wordless Wednesday: Avs won 7-1 edition!